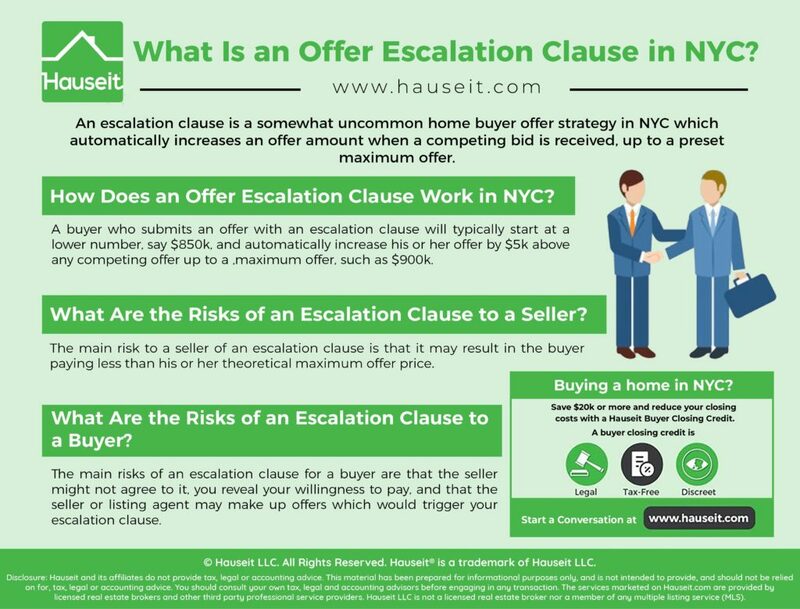 An escalation clause is a somewhat uncommon home buyer offer strategy in NYC in which a buyer automatically increases her or his offer amount when a competing bid is received, up to a preset maximum offer. A buyer may consider using an escalation clause when he or she is bidding on a desirable property but does not want to engage in the typical back-and-forth negotiation which may happen in such a scenario. How Does an Offer Escalation Clause Work in NYC? What Is an Example of an Offer Escalation Clause? What Are the Risks of an Escalation Clause to a Seller? What Are the Risks of an Escalation Clause to a Buyer? A buyer who submits an offer with an escalation clause will typically start at a lower number, say $850k, and automatically increase his or her offer by $5k above any competing offer up to a maximum offer, such as $900k. An escalation clause is most commonly used in a highly competitive situation such as a bidding war or a best and final offer process. Let’s say another buyer submits an offer of $855k. In this scenario, the escalation clause would automatically increase the original buyer’s offer to $5k above $855k, which is $860k. Assuming there are no more offers and the second bidder does not increase his or her offer, the original bidder with the escalation clause will purchase the apartment for $860k. Using this same example, let’s say another bidder submits an offer at $900k. Because the escalation clause is capped at $900k, this means that the original buyer’s offer would not automatically go higher than $900k. An easy way to think about an escalation clause as a buyer is to know that regardless of what other offers come in, you’ll always have the highest offer price as long as the other offers received are at or below your escalation cap. If you’re considering submitting an offer with an escalation clause, you’ll also need to define what documentation or other evidence constitutes ‘proof’ that a listing agent has received a higher offer. Be prepared for possible pushback from the listing agent, as most agents aren’t required to ever provide proof of competing offers so you know they’re not making them up. The offer price of $2,050,000 includes an escalation clause, which increases the purchase price offered to be $10,000 greater than any competing offers up to a maximum offer price of $2,125,000. Please note that the terms of the escalation are consistent with the clause provided for in the REBNY Offer Form. Purchase Price Offered in an amount equal to $2.05 million; provided that, in the event seller receives a bona fide third-party offer on the Property prior to the execution of a definitive contract with the Buyers and in an amount (net of any seller adjustments or credits) equal to or greater than the Purchase Price Offered (the “Competing Offer”), then such Purchase Price Offered shall be increased to an amount equal to the Competing Offer plus $5,000 and subject to cap of $2.105 million (this clause, the “Escalation Clause”). The Buyers must be provided with satisfactory documentation of any Competing Offer. When drafting language for an escalation clause, it’s a good idea to consult your real estate lawyer and buyer’s agent. We explain the risks of an escalation clause to both the buyer and seller in the sections below. The main risk to a seller of an escalation clause is that it may result in the buyer paying less than his or her theoretical maximum offer price. An escalation clause can also divert attention away from a more financially qualified buyer whose offer is beaten by another buyer’s escalation clause. An escalation clause may harm a seller and benefit a buyer because it caps the increments by which the offer with the escalation clause will increase each time. Furthermore, the offer with the escalation clause won’t increase at all if the seller does not receive another offer. If, for example, a buyer’s initial offer is $1,500,000 but the escalation clause goes up to $1,600,000, the seller knows that the buyer is willing to pay $1.6m. Even if another offer comes in at $1,515,000 and the escalation clause triggers a $10k increase, the escalation clause buyer’s offer is still just $1,525,000. This improved offer is still $75k below the maximum they’re willing to pay. An escalation clause can also hurt a seller by capping the degree to which a buyer increases his or her offer in a competitive situation. Whereas a buyer without an escalation clause may increase an offer by $10k or more when faced with competition, a buyer with an escalation clause will only increase by the predetermined step-up amount included in the original offer. Another risk of an escalation clause is that it may cause a seller to focus solely on the offer price instead of evaluating a buyer’s financial qualifications. This is especially important if you’re selling a co-op, as most buildings have specific financial requirements for buyers. 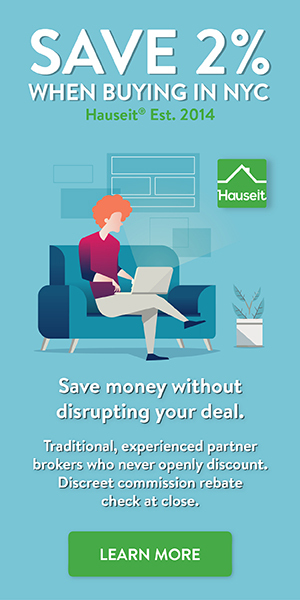 If you’re selling a co-op in a building with a tough board, the truth is that it may be worth accepting a lower offer price if the buyer brings certainty of board approval to the table. An escalation clause can divert your attention away from the more qualified buyer and lead you down the path with a buyer who may not have a high likelihood of being approved. The main risks of an escalation clause for a buyer are that the seller might not agree to it, you reveal your willingness to pay, and that the seller or listing agent may make up offers which would trigger your escalation clause. Some sellers won’t accept an escalation clause simply because they’re unfamiliar with it. Even if a seller has received multiple offers, the chances are that none of the other bidders have submitted an escalation clause. If a listing is headed into a best and final process and the seller and listing agent are feeling confident, they may just demand that you submit your best number and drop the escalation clause language even after you’ve submitted it. If a seller rejects your escalation clause, you will have already revealed how much you are willing to pay through the offer cap in your offer language. A seller who is a shrewd negotiator could force your hand and essentially make you submit your highest offer right away. Once a seller receives your escalation clause, it could also motivate them to go above and beyond to procure other offers which would trigger your escalation clause. The final risk of an escalation clause is that a listing agent or seller may be tempted to stretch the truth, either by making up other offers or exaggerating how real they are or what their offer levels are. Therefore, it’s very important to include language in your escalation clause which obligates the listing agent to provide proof of any other offers which trigger your escalation clause. What Is a Contingent Offer on a Home?